Mayfair and Marylebone is a district of central London. 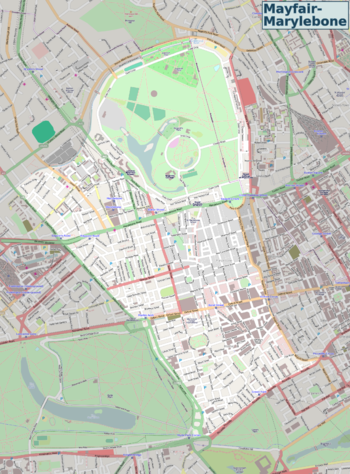 This is a large area of central London with the south encompassing the whole of Mayfair and Piccadilly and the north the whole area from Oxford Street through Marylebone to Regent's Park and the border with St John's Wood. Mayfair is named after the fortnight-long May Fair that took place there from 1686 until it was banned from that location in 1764. (Before 1686, the May Fair was held in the Haymarket; after 1764, it moved to Fair Field in Bow). The area was owned by the Grosvenor family and much of the land is still part of the Grosvenor Estate, having been originally developed for residences from the late seventeenth century. This is an extremely well-heeled district, reflected in it being the location for many of London's most exclusive shops, restaurants and hotels, a fact famously symbolised by its appearance as the most expensive property on the London Monopoly board, closely followed by one of its main thoroughfares, Park Lane. The district includes several major shopping streets, including Bond Street, Regent Street, Jermyn Street and much of Oxford Street. Marylebone to the north of Oxford Street, is less grand than Mayfair but is still home to some very desirable housing, as well major tourist attraction such as Madame Tussaud's, The Planetarium, the fictional haunt of Sherlock Holmes in Baker Street and the wide open green space of Regent's Park. Piccadilly Circus (Piccadilly and Bakerloo lines). Oxford Circus (Central and Bakerloo lines). Green Park (Piccadilly and Victoria lines). Edgware Road (Circle, District and Hammersmith lines). Hyde Park Corner (Piccadilly line). The Tube is the best way to reach Oxford Street; although there are plenty of buses serving the area, the traffic congestion is pretty bad, and the wait can be lengthy. The Central Line runs pretty much directly beneath Oxford Street at this point, with four stations along its length: Marble Arch, Bond Street (also served by the Jubilee Line), Oxford Circus (also served by the Bakerloo and Victoria lines), and Tottenham Court Road (also served by the Charing Cross branch of the Northern Line). If possible, avoid Oxford Circus Station, as its layout is confusing and it's also very busy; at times it can be difficult to get out of the station at all due to pedestrian congestion outside. Marylebone Station is also a mainline rail station, this terminus for trains from Birmingham, Warwick, Banbury, Aylesbury and High Wycombe is one of the best preserved Victorian railway stations. With Oxford Street on its southern boundary, there are no shortage of buses. 23 & 7 travel up Edgware Rd and on towards Bayswater & Notting Hill. Haunch of Venison Gallery is one of several commercial, boutique art-galleries scattered around the area. Oxford Street has been a shopping mecca and London's premier shopping street since 1908, will max out your credit card and will provide you with a store for anything you need. Virtually all of the major British retail chains have their flagship branches along Oxford Street. Selfridges is worth a visit for its food hall; it also has a great selection of bottled beers. John Lewis is good for fabrics, knitting supplies, other crafts, furniture, and homewares in general. Intersecting Oxford St proper is Regent St, which houses the famous Liberty department store, again worth a visit for fabrics and home furnishings. Also interesting is the Dickens and Jones department store. The eastern boundary of the area is marked by Tottenham Court Road, which is London's famous area for specialist electronics, hi-fi and computer equipment shops - most of these are concentrated near the southern half of the road, whilst the northern half is famous for its furnishing stores. If your taste is for mainstream designer label gooods, try Bond Street. Synonymous with international designers and luxury goods, it is a great way to experience London's finest at its best. The street is recognized as the premier location for shopping in London, and perhaps the world, featuring brands and designer labels recognized the world over. Savile Row is synonymous with perhaps the highest quality men's suits in the world. There are many bespoke tailors to chose from, most of whom are behind quite discreet shop fronts. If you feel like really treating yourself, nothing could be more London than a suit from Savile Row and a shirt from Jermyn St.
Artesian Bar at the Langham The Langham, London, Portland Place, London W1B 1JA Called the World's Best Bar three years in a row by Drinks International Magazine, the Artesian is at the forefront of experimental mixology. Every cocktail is expertly crafted and unlike anything you will have seen before. Open Monday - Saturday 11am - 2am, Sunday 11am-12 noon. Typical price is £17 for a cocktail. Crowds Oxford Street is very busy most days of the week, and can be unbearably so during the weekends - the areas around the junction with Tottenham Court Road, Marble Arch and Oxford Circus in particular. If you are in a hurry, be a Londoner and avoid the crowds by diverting via the back streets which run parallel to Oxford Street - plus you have the advantages of stumbling upon little gems such as restaurants, cafes and bars that are off the beaten track! Begging & "Chuggers" Most homeless people asking for money won't and don't usually physically accost you, however, you will see them selling the "Big Issue", which is a magazine published by a homeless charity. "Chuggers" (short for "charity muggers") are easily spotted - they usually carry a clipboard and wear a brightly coloured waistcoat with the name of a mainstream charity (e.g: Oxfam, Save the Children etc) . Most chuggers are students who have been recruited by a charity to waylay passersby and ask if they want to sign up to their charity. Please remember that you are not obliged to purchase either product although some chuggers can be far more persistent and will try and attract you in a more aggressive manner. To get rid of these people just say "No" firmly or ignore them. Targeting If you are a young woman on her own you may become targeted by young men working in the t-shirt shops who wish to invite you for a meal and become quite persistant or young men saying that they have "seen you around" and want to know your name. Firmly tell them "No" and walk away, they should leave you alone. If you do have to pass by one of the shops where you have been targeted, usually expect nothing more than a cat-call. Remember if you do feel harrassed, please call the Police. Buses at night It is safer for the lone traveller to sit downstairs and towards the front. It is inadvisable to sit at either the back, (as these seats are monopolised by youths), or upstairs. If you must sit upstairs it is not recommended that you sit at the back. This page was last edited on 20 September 2018, at 13:39.